I became a painter, to show people things in ways they have never seen before, in ways, they have never thought. Behind every painting is a powerful story which is waiting for revelation. I am a Czech painter, born in Prague in 1982. 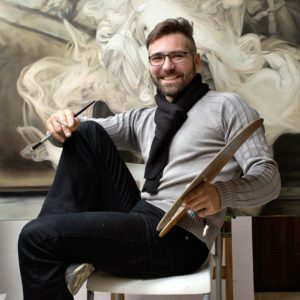 I studied art at High school and at Academy Of Fine Arts in Prague in the studio of classical oil paintings. I am deeply focused on realistic oil painting and my previous major paintings depicted mainly landscapes and the human figure with expressive gestures reflecting life and the world in modern society. Currently, I create realistic paintings using abstractly shaped masses, which reflect life and reality in a wider context, leaving space for viewers interpretation. My goal is to create a perfectly balanced paintings, where reality meets abstraction, mystery and the desire to explore the unknown – a deep story with a perfect technical performance of the painting. Each theme is carefully created and transformed into a comprehensive visual form, which has only one task. Act on the viewer’s emotions through colors and shapes. My earlier works were, in most cases, composed of realistically painted landscapes and figures. But currently i gave up a mere rewriting reality to the canvas. It’s simply not enough for me at this moment. I try my paintings move away from all that is possible to see around us and insert into them my own unique vision. Everything is still done with a precise technique of oil painting and i believe that gives to my canvases extraordinary depth and weight. My father has been painting since my childhood, I loved the smell of paints, oils and varnishes. Especially the unmistakable creative atmosphere hanging in the air, along with a clean white canvas and almost palpable inspiration to which the canvas starts to submit in a short moment. Painting captivated me and I have painted everywhere and everything. I’ve always tried to make the image the most faithful reflection of reality, along with capturing the overall atmosphere. This kind of painterly expression and desire for improvement has become a lifelong obsession for me. My existing paintings mainly included figurative motifs with deeper meaning planes, landscapes and animals. At the moment, however, I have given up on stark rewriting of reality on the canvas and have begun to explore the parallel possibilities of the same expression in a more abstract form, always using classical painting techniques of layered oil paintings with a carefully prepared theme. I’m trying to, through composition, shapes, colours and depth of images, to evoke the impression of a true reflection of a certain part of our world. However, in an intangible abstract level. The inspiration for my paintings is usually my imagination regarding our or other worlds, other physical patterns and other correlations other than human has designated for the understanding of life on earth. What I’m also interested in and what keeps me busy is the search for abstract ways of expression to the real situation or real experience. For me it is literally endless scope with unlimited range of combinations and possible tones of the image. I usually try to view everything around as an observer, unencumbered by human knowledge. Inspiration to me is also study of literature, study of patterns here on the earth as well as the universe, various physical theories, inventions, discoveries, ancient civilisations and a possible life elsewhere in the universe. I often talk about my paintings as realistically painted abstractions. It’s because each painting is preceded by several models and studies that in the final stage are carried out in the final painting through a very precise realistic layered oil painting. The paintings combine both realistic and abstract elements, while the credibility and convince of the whole theme is enhanced by classical painting technology. Most of the ideas for paintings are developed by creating a central theme/model. This model created from malleable material is embedded into aquarium with water, where with the help of different combinations of colours and swirls I create then overall atmosphere of the image. I take photos of all these phases of development. The process is lengthy and usually only one photograph of several thousand photographs approximately fulfils my expectations. Creating the image from such patterns is sorted with brushes and my clear idea. Painting is a means for dreams for me and realisation of unbounded worlds. It is also the absolute freedom of expression where a single judge and defender is myself and the particular medium. It is also a daily discipline and humility, when a person comes into the studio and is aware that there is still lots to learn in life and especially lots to understand. It is an endless search with increasing adrenaline of what else is going to be discovered and identified. The finished canvas is some kind of record of what experience and knowledge has been acquired in my mind.